Should you buy a spring or foam mattress? How thick should the comfort layer be? Do you want a quilted or tufted mattress? Which materials are best for you? These are just some of the questions you may be thinking about if you’re choosing a mattress. To ensure you select a quality mattress, keep the following essentials in mind. Your mattress gets more wear than almost any other piece of furniture in your home. You spend nearly a third of every day and potentially even longer in your bed. In most cases, you don’t spend that much time on any other furniture or in any of your clothing. To withstand that intense amount of wear and tear, your mattress needs to be made of quality materials. While shopping, look for top notch durable materials such as cotton, Joma wool, or Talalay latex. Durability is only one of the elements you should consider when you’re looking for a mattress. You should also think about the impact the materials may have on your health. If you want to avoid the potential build-up of dust mites, look for a foam mattress — these materials are also resistant to mold and bacteria. On the other hand, if you want to avoid synthetic materials, you may want to choose a natural latex foam, cotton, or wool. You need support while you sleep, but the right amount of support varies from sleeper to sleeper. Luckily, there are a lot of options, so you can find the right fit for your body. Innerspring Mattress — With an innerspring mattress, coils are connected throughout the entire mattress. This provides both softness and support, however, there’s more motion transfer with this type of mattress than others. Pocketed Coil Mattress — For a firmer choice, you may want a pocketed coil mattress. These mattresses have the coils individually wrapped in pockets of soft material. This reduces the ripple effect while still retaining the support you expect from a spring mattress. Whether you choose innerspring or pocketed coils, consider finding out more about the gauge of the coil. Higher numbers such as 18 indicate thinner coils, while lower numbers such as 12 indicate thicker, firmer coils. 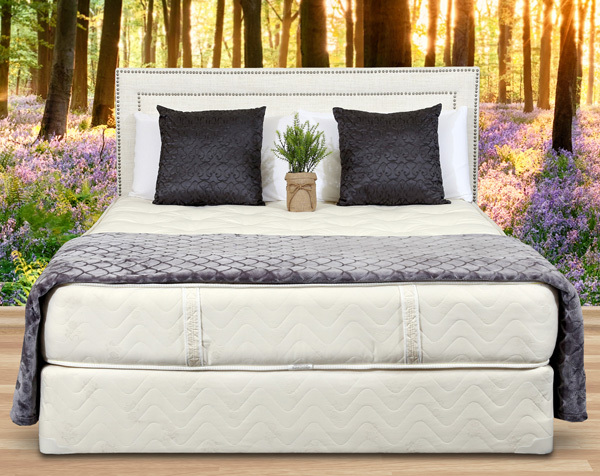 Memory Foam — These mattresses feature a polyurethane core and they have less spring than innerspring and pocket coil mattresses. The thickness can vary, and the thicker the mattress is, the more you’ll sink in. While looking at these mattresses, check out the density. Five pounds per cubic foot is high quality, while three pounds per square inch or below is a budget option that won’t provide support as long. Latex Mattress — Offering similar amounts of support as memory foam mattresses, latex mattresses are long lasting. Although they are often more expensive than other mattresses, latex mattresses are an investment. They can often stay comfortable for up to 20 years. Whether you choose a spring mattress or a foam one, there may be a comfort layer on top of the support layer. Depending on the mattress you choose, this layer consists of cotton padding, foam-backed covering, or layers of foam. In some cases, you can choose the topping you want for your mattress to ensure you have the exact comfort layer you want. Keep in mind that quality is key. If you buy a mattress with a low-quality comfort layer, it will become quickly compressed. To avoid that, you need to invest in a mattress with a high-quality comfort layer, or you may want to add a replaceable feather or foam mattress topper. If possible, find out how the mattress is manufactured. For innerspring and pocket coil mattresses, the most popular construction techniques are quilting and tufting. Both options have their pros and cons, but regardless of which construction method you prefer, you should look for a manufacturer that does as much of this process by hand as possible. In addition to making the mattress by hand, the manufacturer should pre-compress the materials. When springs are pre-compressed, that reduces the amount of compression they are going to undergo when you start using the mattress. In contrast, if the springs are not pre-compressed, you may notice the mattress losing some of its comfort and resilience in the first few months that you own it. For those same reasons, you also want pre-compressed upholstery on your comfort layer. While choosing a mattress, don’t forget about the importance of a quality box spring. The box spring provides support for your mattress and helps the mattress keep its shape over time. The only time you don’t need a box spring is if you have a platform bed or an adjustable base that takes the role of the box spring. The quality of the mattress is important, but to really hone in on the right bed for your needs, you should think about your sleeping habits and preferences. If you tend to sleep on your side, you may want to look for a foam mattress with a fluffy topper that can provide you with pressure relief. If you sleep on your stomach, you may not want to choose an adjustable base, and back sleepers will likely want a blend between a firm and soft mattress. You deserve a quality, affordable mattress. We offer factory direct mattresses, and that makes it easier to invest in a quality mattress without breaking your budget. Contact us today.